Customer’s nowadays are aware of the competitive market and know they have variety to choose from. Companies try to present their products in the best possible way, in order to grab customers. 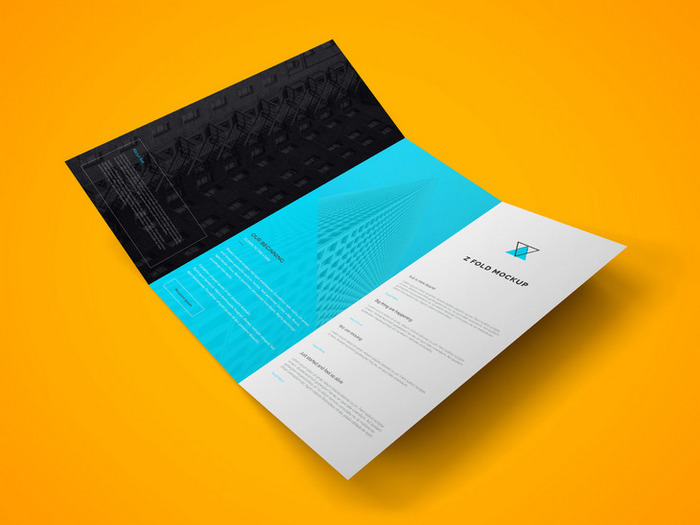 Catalogues and Brochure mockup top this list. To save time customers take brochures and catalogues from different companies and then leisurely spend time at home by going through them before they decide which company to buy from. So, you would want to have the best to offer your customer and your brochure or catalogue must be presented in a way that it appears candy to the eyes of the customer. 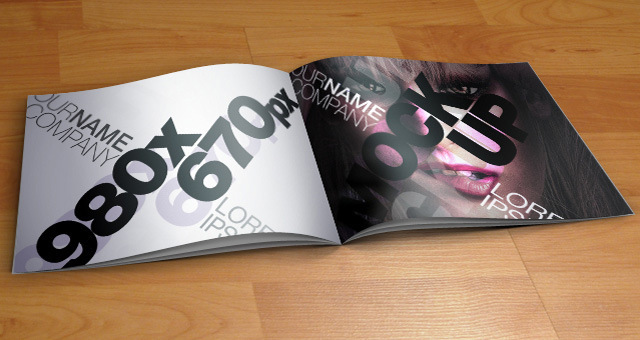 This brochure you give carries your companies brand name, so be sure to give them something attractive and impressive. PSD Templates are perfect in describing and allocating prices for each product. There are different types of formats some with smart object that are available in PSD templates and you can select one according to how you want your products to appear. Brochures and product catalogues are an important tool for marketing. They inform your customers about your products and services. The idea is to design a catalogue that your customer readily runs through it – making sure your products are meritoriously advertised. You can use the Template PSD’s available online to present Mock-ups to your clients and show them how creative you are. 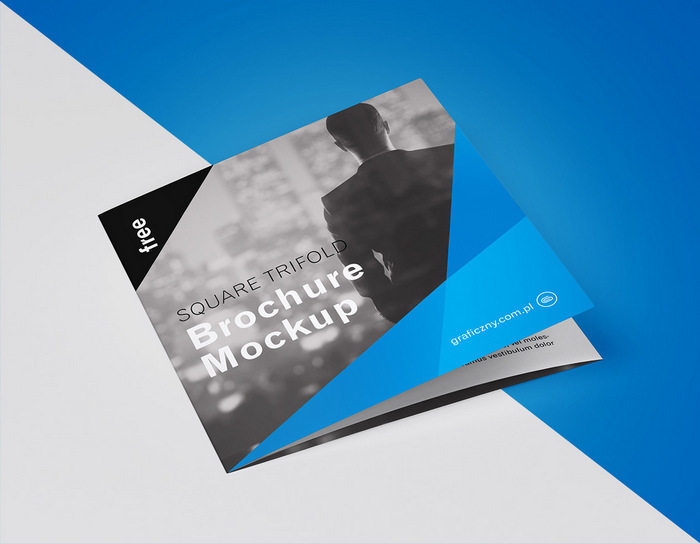 There are many free Catalogues and brochures mockup Templates available on the internet for you to download. We have collected the best twenty different templates with various features for you. You can go through them and select one which suits the best for your type of business. Our recent collection of 21 Free Brochure Templates is a must read as it provides free downloads to make a brochure design from psd. 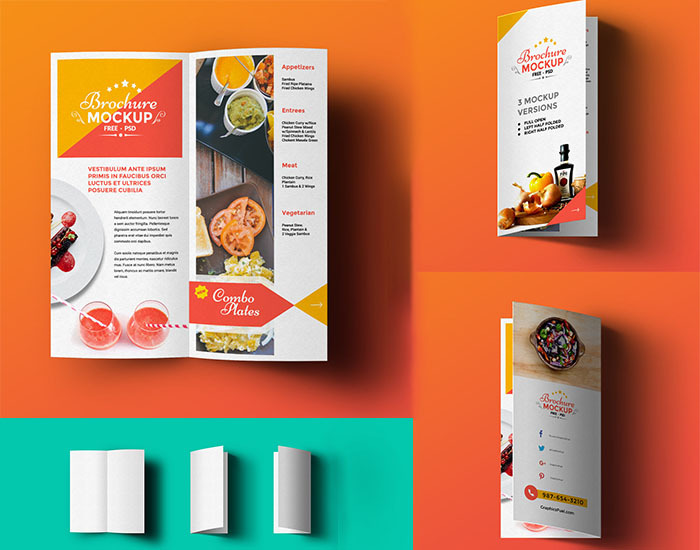 Simple and hassle-free, mock-ups are an easy way to present your designs to your clients. You can be creative and use your imagination to create some wonderful designs with this template. 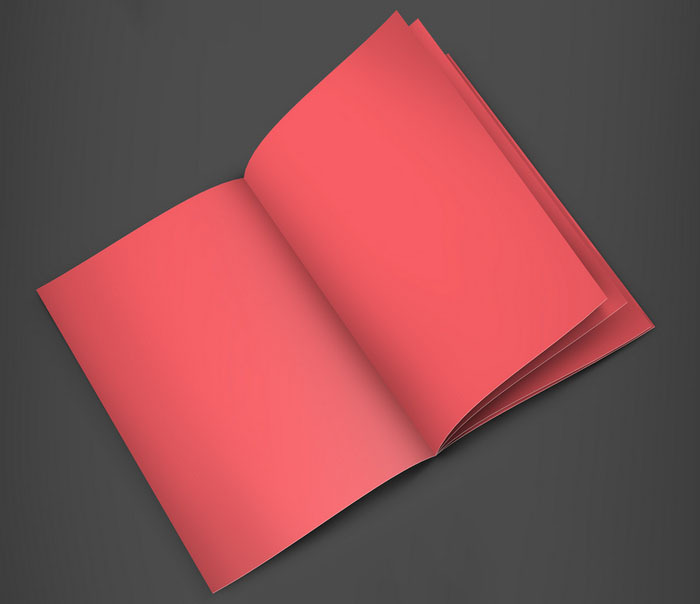 Three Page Brochure Mock-up can also be used to display your book or magazine. It come with smart objects, changeable background colours and is a Zip layered PSD file. With the Catalogue – Brochure – Magazine A4 Mock-up you can showcase your artwork or design. The Mock-up is completely editable and the PSD also has smart layers to easily use the drag and drop feature in it. 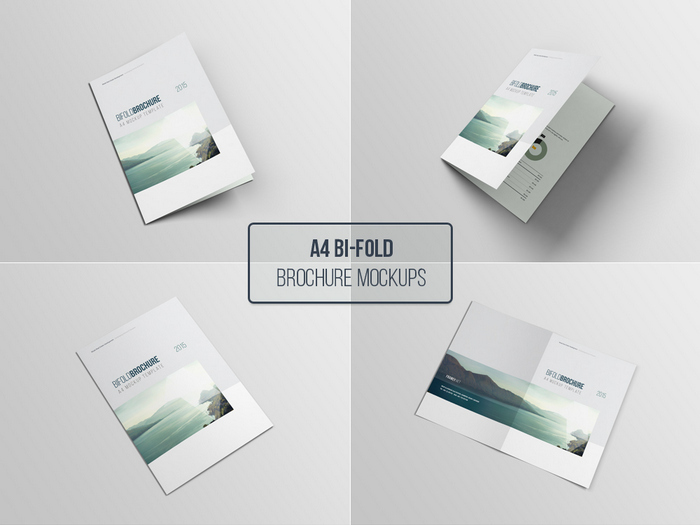 The Free Bifold Brochure Mockup comes in three versions: right folded, left folded and full open. There are many pictures and fonts that come free with this Mock-up. You can either use the smart-object layers or you can add your own text or images and showcase your own realistic brochure design. 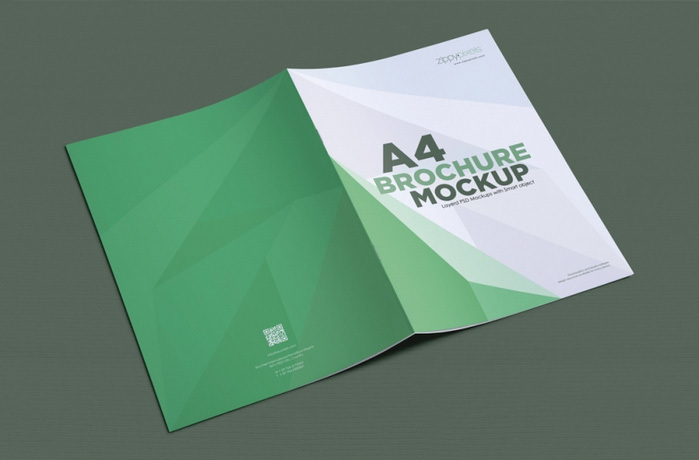 You can use the Free A4 Brochure Mockup PSDs to design yourself an amazing brochure. It is fully editable with smart objects and you can put in your own thought and designs that you like. It is super easy to work with its features and yet the results are extraordinary. If you are looking for a free but top notch quality Mock-up you have it all in Free A4 Paper Brochure/Flyer Mock-Up PSD. This is an A4 presentation PSD flyer mock-up and will help you present a neat, beautiful and a professional mini A4 poster and flyer. You can easily drag and drop the designs or objects as it uses smart layers. There are 14 arrangements and angles of accurate 3D models. It works on a high resolution of 2847×1472 and you can easily update all the views with one smart object. You can change background colours and is set up on singular PSD file for your easy working. The layers are all properly named and organised. 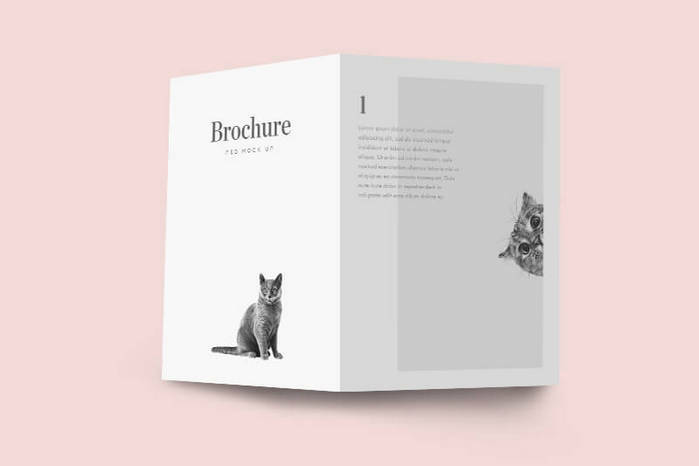 With the Free Bi-Fold Brochure Mock-up you have the power to change every feature of the theme designs like the fonts, patterns, colours etc. The more creative you are the more beautiful your design is. The Mock-up is easy to use and your designs are definitely going to stand out using this Mock-up. 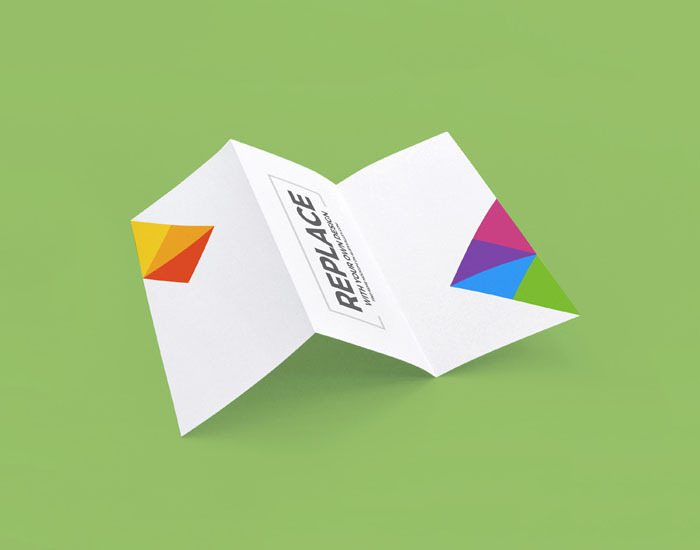 The Colourful brochure Mock-up PSD makes eye bobbing brochures as well. It is the most likely way to showcase a product or company’s offers and sales. The beauty is the many colours that you can use in this PSD. The effects are amazing and are definitely going to impress your client once your thoughts complete the design. The colour mode used on this Mock-up is CMYK and has a perfectly aligned Typography. There are many free fonts and colours that you can use to design your special style. 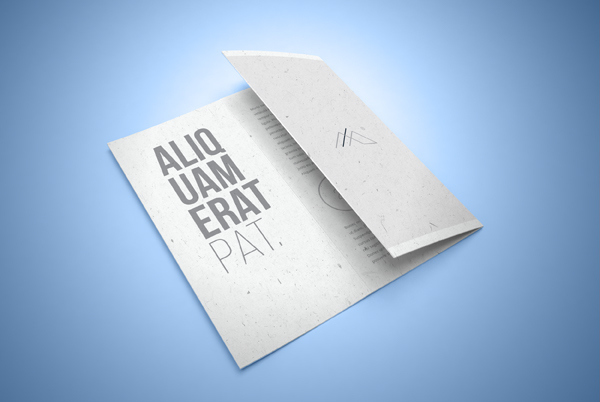 A perfect A4 size Mock-up to make your work to look stylish. Smart-objects allow easy editing and it also includes preview files. The best thing is it comes for free. This free Bi-Fold has many feature including a front and back view to help you present your printed brochure design. You have the option to impress your clients with just one view of the first page of the brochure. Make the best smart objects and go get that client. 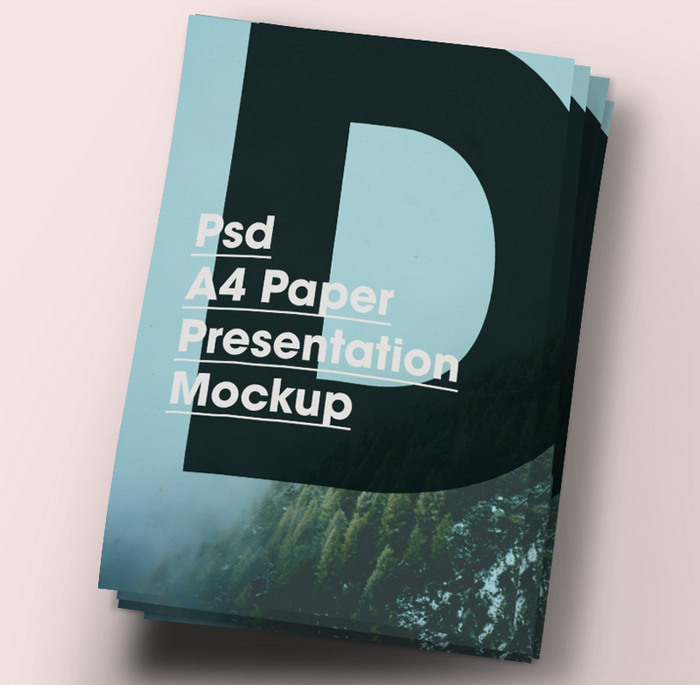 The A4 Brochure PSD Mock-up is simple yet elegant. It is a fully layered PSD file and has smart objects so that you can easily place them in your designs. A wonderful PSD Mock-up so you can present the best designs to your customers. 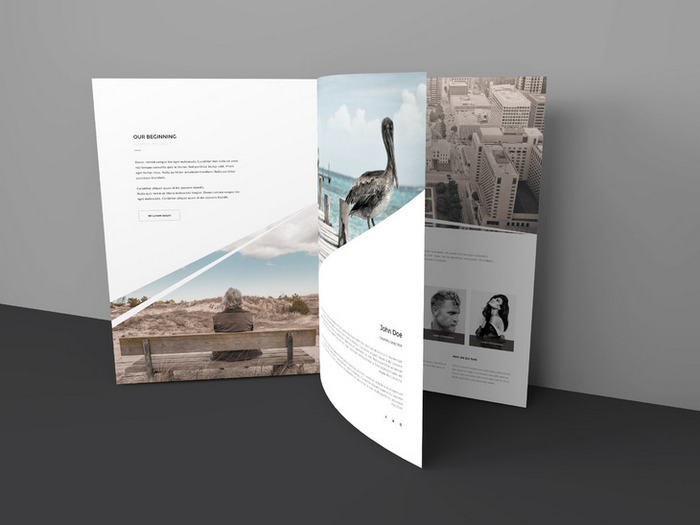 The Z Fold Brochure PSD can be downloaded for free; it helps you to get the maximum of your thoughts and ideas. You can change your designs using smart layers. Working with Z Fold PSD is fun as you can change the background and colours using your imagination. This is horizontal A4 Mock-up and features separate shadows, shades and lights and you can increase and decrease their intensity. It is fully editable and comes with Smart objects. It has transparent backgrounds and well organised and named layers. The number of features is going to get the most outstanding Mock-up to showcase to your customers. 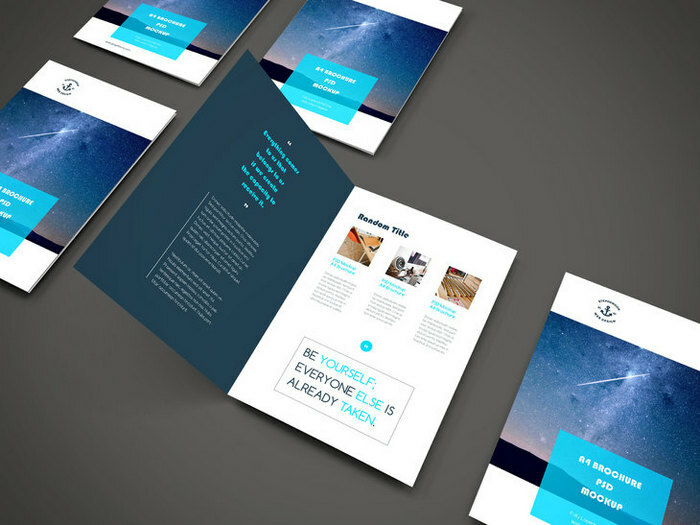 If you want to make your brochure extraordinary the Tri Fold Brochure PSD is what you are looking for. Because of it being Tri Fold you get to showcase the front cover design of the brochure. It has high resolution files and like other PSD’s Tri Fold it also gives you the option to change background colours and fonts. 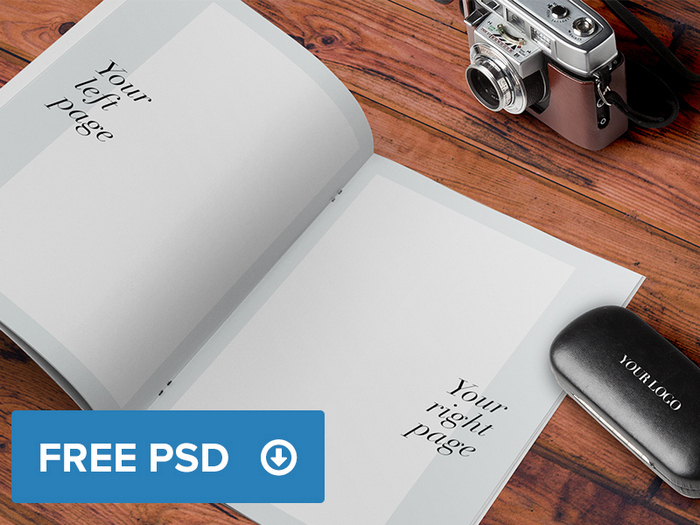 Another free downloadable Mock-up. You can easily replace pages with the designs that you like using smart objects, double click your mouse on the Smart layer, copy and paste your design and save. It is that simple. There are hundreds of users with good reviews about Smart Brochure Mock-up. 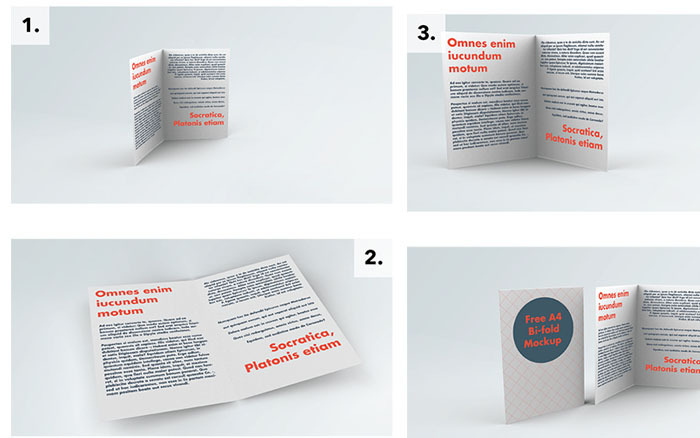 Free A4 Booklet Mock-up is an A4 PSD booklet. 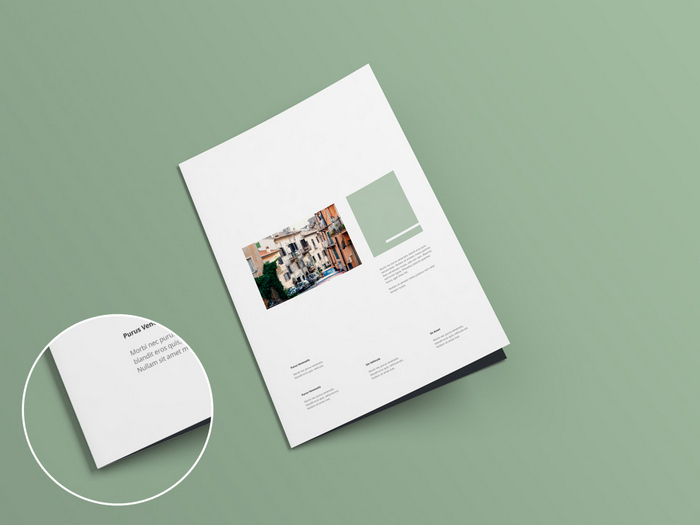 This is a wonderful catalogue template Mock-up to present your works. It has high resolution to enhance the look of your artwork. All the designs are completely editable and you can put in your ideas to beautify your design according to your customer’s requirements. 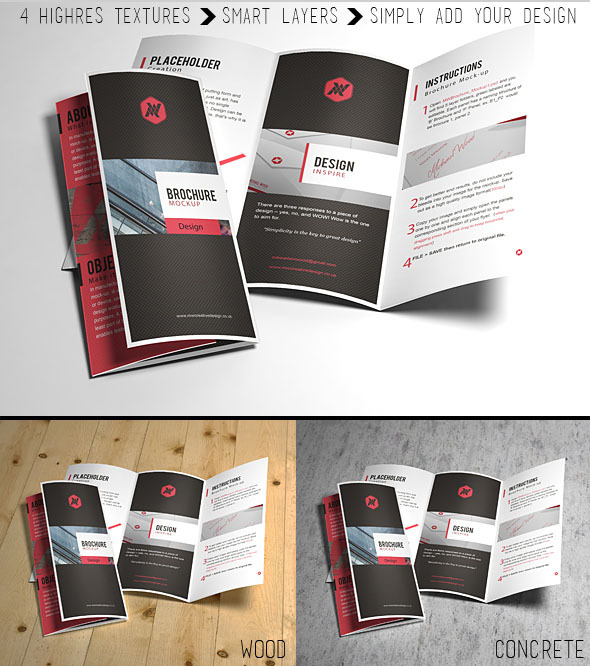 The Half-fold brochure Mock-up free PSD has a full 03 editable PSD which you can use for printing, to preview and to advertise. These PSD files use Smart object so that you can easily replace the Mock-up content fast and easy. 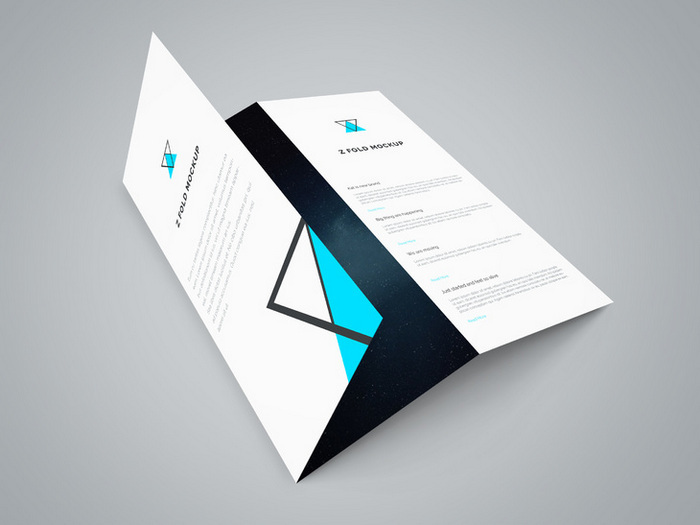 Half-fold brochure Mock-up free PSD helps you get a realistic design to showcase your customers. 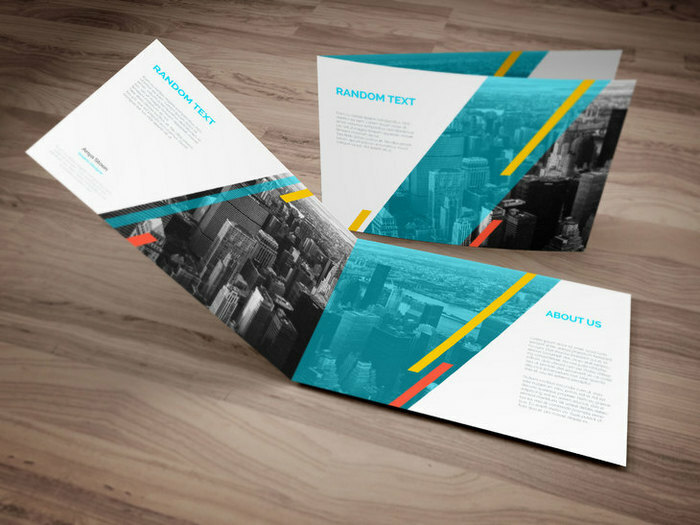 Trifold Brochure Mock-up – Smart PSD is a new freebie that you can download for your work. This PSD file also has smart layers; you can use different colour backgrounds to adjust your work. There are many fonts for you to choose from with smart objects using which you can make a wonderful artwork. PSD Catalogue Mock-Up Template, is one of the best free template available to showcase your final work to your customers or your portfolio. You can size your design at an amazing 980 x 670 pixels and the smart object action helps you to display your catalogue’s design to its best.